I came across the recipe for this amazing dip the other day on That Skinny Chick Can Bake. It may sound like an unusual combination of ingredients, but I promise you that you'll fall in love with the flavors and textures. And, even though there is mayo and sour cream included, it's a dip that doesn't feel heavy. It's perfect for summer gatherings ... I have yet to meet a party guest who didn't flip over this dip. I did change up a few things with regards to the recipe. I did not add in the jalapenos that were called for and I added in some fresh cilantro. You could cut down on the calories a little by using low-fat sour cream and low-fat mayo, if desired. 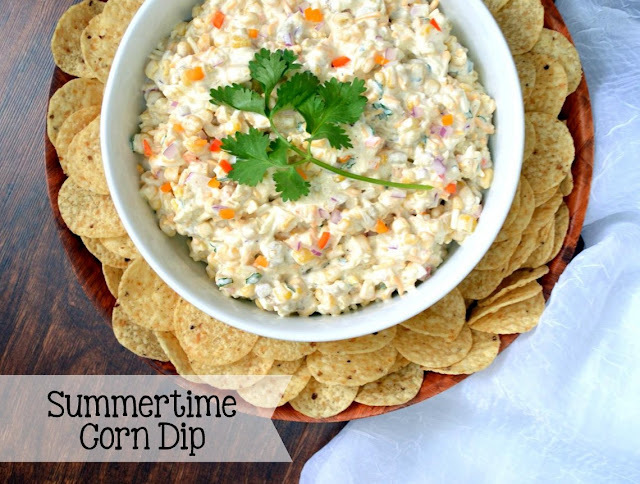 My hubby was able to walk next door and pull some green onions from my mother-in-law's garden for this dip and we utilized fresh corn on the cob (frozen can be used and is called for in the original recipe). The recipe is super easy to whip together and keeps well for a few days in the fridge. The flavors get better after the dip is allowed to sit for, at least, a few hours, so it is the perfect make-ahead party fare. Combine all of the ingredients in a medium bowl. Cover and refrigerate until ready to serve. Serve with tortilla or corn chips. If using fresh corn on the cob - blanch corn for about ten minutes in boiling water. Remove corn and rinse under cold water, then cut corn off of cob. If using frozen corn - allow corn to thaw completely prior to adding to dip. Yum - this looks perfect to take to my next family get-together! Love the cilantro addition.